I recently returned from a Mark Twain conference in Hannibal, MO, and I noticed a change in Twain’s hometown since the last time I was there in 2011. There’s a lot more steampunk stuff. The town is already a tourist destination, with several blocks restored to their 1840s-era look. Twain’s home, his father’s law office, the homes of citizens who inspired characters like Huckleberry Finn and Becky Thatcher are all standing. With all the original architecture, it’s a logical place for steampunk gatherings. Twain’s home in Connecticut, for example, already hosts steampunk-themed events. In just four years, however, it seems Hannibal has embraced steampunk in a big way. 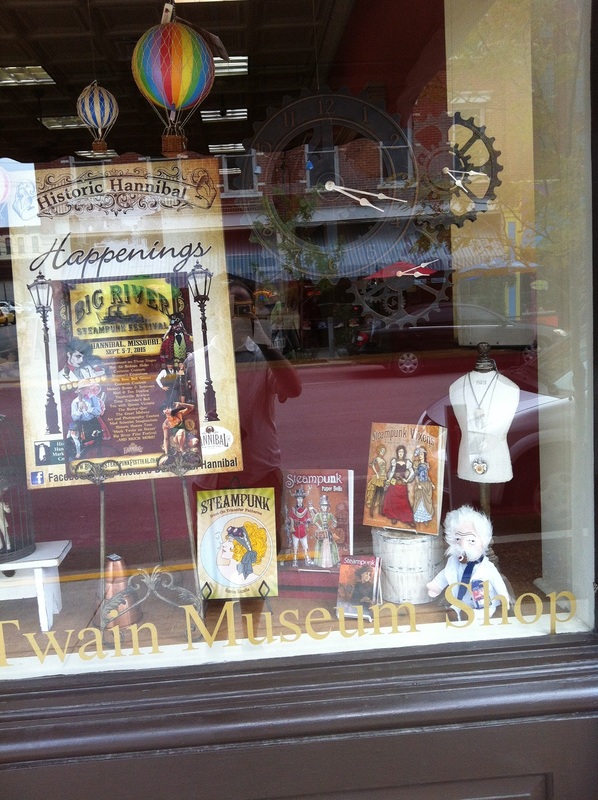 The store at the Mark Twain Museum Shop features a steampunk window display, including a poster for an annual Labor Day weekend convention: the Big River Steampunk Convention. Check out the Tom Sawyer and Becky Thatcher armed with clockwork ray-guns in the image on the right! The Boyhood Home Museum has steampunk paper dolls and jewelry, with the sign below for explanation to literary tourists unfamiliar with the genre. 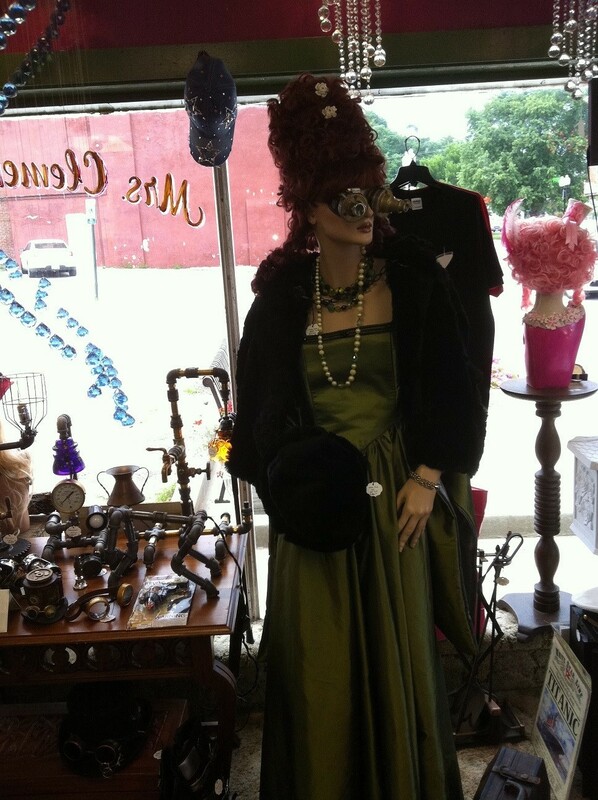 The photo below is from Mrs. Clemens Antique Shop. They have an entire area of Victorian-era clothing and steampunk gadgets. So what do I make of this? It’s probably just another example of how mainstream steampunk has become. But it’s also a great example of an existing 1800s-era historical site connecting with existing fandom in a logical, synergistic way. The conference itself was excellent. The online PDF schedule on the conference site lists all the presentations and presenters, a fine collection of Mark Twain scholars from academia and beyond. 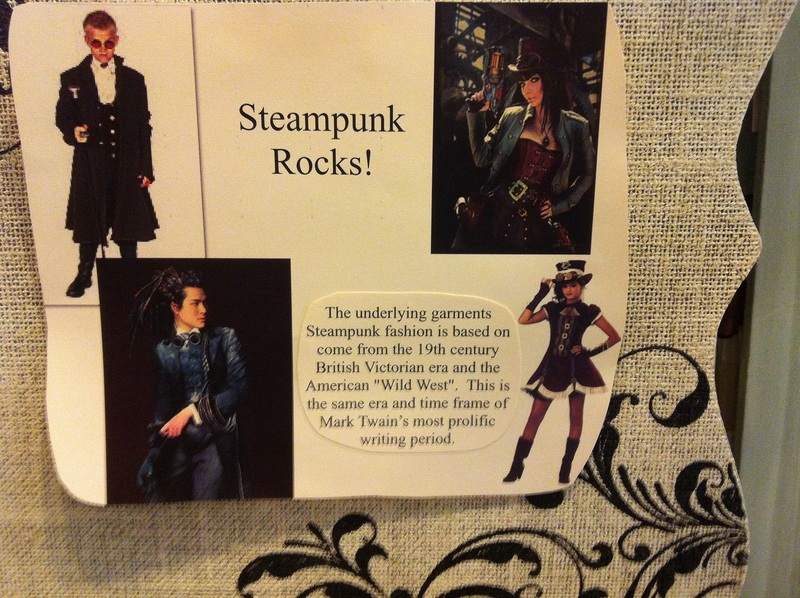 This entry was posted in All Posts and tagged Becky Thatcher, Clemens Conference 2015, Hannibal, Mark Twain, steampunk, Tom Sawyer. Bookmark the permalink. I love the idea of _Roughing It_ as a space opera. All of Twain’s odyssey stories make good space opera. There. I’ve gone and thought of another concept which requires care and craft to properly execute. Absolutely! I keep toying with the idea of Innocents Abroad or Following the Equator as a science fiction narrative, some kind of world tour of the future, with that jaded, Twain-ian viewpoint.